Another bit of the canceled Constellation project just actually rocketed into the skies: A testbed Orion space capsule has followed the Ares I-X atop a fiery plume off the launchpad. But unlike Ares, Orion may actually reach space. Possibly. Today the Orion capsule, a 16-foot diameter, 11-foot tall space ship roughly the same shape as those used to bring Apollo astronauts back to Earth in the 1960s and ’70s, was catapulted into the air by rocket. After a brief parabolic trip after the solid fueled engine burned out, the capsule correctly deployed a parachute, and then drifted back to the sands of the New Mexico desert test location. It was a success, it seems thus far, and an important one: The rocket that lifted the multi-million-dollar, multi-tonne hunk of hardware into the sky was actually a launch abort system, a mini-sized but extremely potent system mounted atop the capsule. 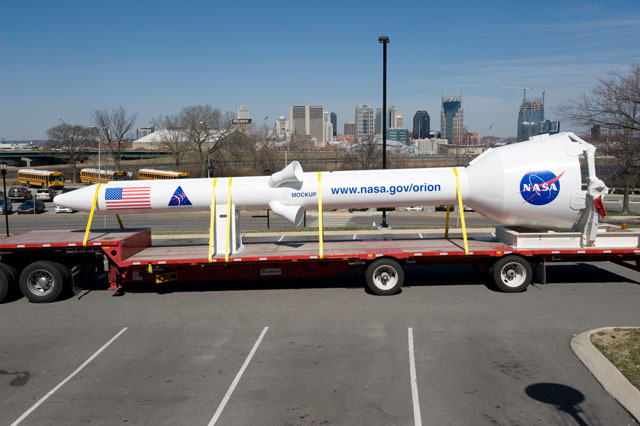 It’s designed to rip the capsule out of its actual space launch vehicle and propel it to a safe distance away should some sort of fatal disaster befall the Ares I solid fuel rocket beneath (think Challenger disaster, and you’ll get the picture). It may be a mere “backup” system for use in emergencies only, but it’s probably more potent than the very first German V1-inspired rockets cobbled together in the early days of the U.S. space industry. Those first rockets evolved from their early stages into the Redstone and, ultimately, Saturn rockets that took humans into space and then to the moon. But with Constellation canceled at the hands of a tightfisted Obama administration, Orion’s future potential for manned space trips is less than assured. The plan is to continue developing Orion, possibly for use as the manned module atop a future NASA-, or privately funded rocket system, or for use as an emergency escape pod for fleeing the International Space Station.